Over 8,000 species of centipedes have been identified in the world, all varying in different sizes and colors. Centipedes can be as small as a few centimeters to as large as 30 centimeters. Centipedes are known for their many legs and a distinct venomous claw on the rear end. Some centipedes can have as few as 30 legs others can have as many as 354 legs. Their heads are round with a pair of long antennas and mandibles. Centipedes live a cryptic lifestyle, remaining hidden in the dark depths of the earth for the majority of their life. Many centipedes are found under logs, rocks, leaves or any dark and damp location. Centipedes are adverse to cold weather and can make their way into homes while seeking shelter. 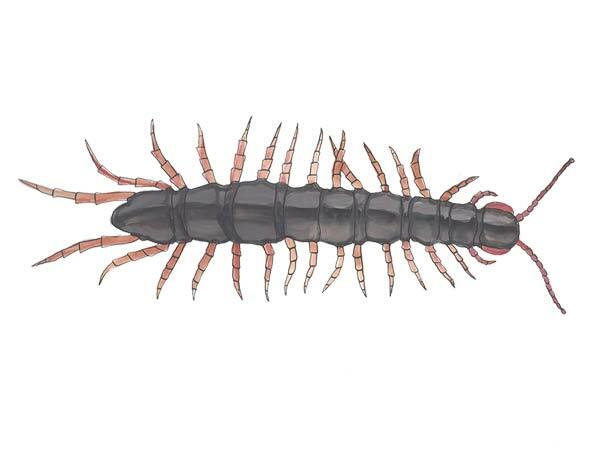 When found inside residential homes, centipedes will favor garages, bathrooms and other damp rooms. House centipedes are actually beneficial because they eat cockroaches, silverfish and other unwanted pests. Centipedes have 6 larval molts and 4 post larval molts prior to reaching adulthood. Some females can produce as many as 150 offspring in a lifetime. In cooler climates, centipedes only lay eggs in the spring and summer. However, in subtropical climates such as Florida, centipedes can lay eggs throughout the entire year. Female centipedes can lay as many as 10 to 60 eggs at a time. The eggs will take between 1 to 3 months to hatch and adults will live as long as 6 years. House centipedes will eat a variety of unwanted pests such as silverfish, beetles, roaches, flies and spiders. In their natural habitat, centipedes are opportunists and will eat any soft-bodied insect smaller than them. Centipedes can inflict an intensely painful bite with their forcipules or pinchers. The centipede uses its pinchers to break the flesh and then uses its claws like a syringe to draw venom out of poison sacs and injecting it in into the wound. Centipedes like damp and moist environments. The first step to controlling a centipede infestation is to modify the environment. Fix all leaky plumbing and ventilate rooms with high moisture content. If moisture problems persist, then the home should be checked for larger issues such as leaks or flooding. Reduce the food supply. Centipedes feed on insects such as roaches and other arthropods. General pest control treatments will eradicate unwanted pests from the home and discourage centipedes from dwelling in the structure. If modifying the environment proves unsuccessful, a variety of insecticides are available for centipede pest control. Synthetic pyrethroids such as permethrin, is one of the more popular insecticides used for centipede control. Apply a low volume spray into small cracks and crevices inside the home. Follow up with an exterior perimeter spray. We are experts at solving problems with centipedes in home. There is no problem we havent seen in our 80 years of experience. Want to know how to get rid of centipedes and centipede problems? Call or email us for a free inspection.